The Office of Federal Contract Compliance Programs (“OFCCP”) held two town hall sessions in New York City this week, focused on the financial and legal industries. The town halls followed the format of earlier sessions, with attendees being asked to provide feedback about several topics, including the agency’s current enforcement practices and ideas for how the OFCCP could help contractors promote diversity in hiring, fairness in promotions and disability inclusion. 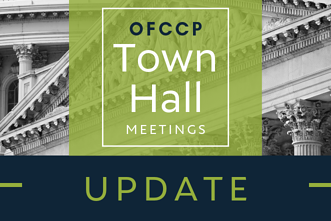 Although the town halls were focused on specific industries, OFCCP discussed several issues that will impact all federal contractors. The agency announced that two new information collection requests (ICR) would be open for a 60-day public comment period in the next several weeks. The first ICR is related to the current Supply and Service Scheduling Letter and Itemized Listing. This ICR is used in all supply and service establishment and FAAP reviews, and was last significantly revised in 2014. The current forms are set to expire on June 30, 2019. Although the Scheduling Letter and Itemized Listing are typically renewed without significant revisions, comments from agency officials at the town halls suggest that OFCCP will propose revisions to the Itemized Listing during the approval process. These changes will impact any compliance reviews scheduled after the new letter is approved, including those on the recently-released FY 2019 scheduling list. The second upcoming ICR relates to the AAP verification program that OFCCP Director Leen has spoken about for several months now. Agency officials stated that the new ICR will allow OFCCP to begin asking contractors to submit annual documentation demonstrating that timely annual AAPs have been prepared for all establishments directly to the OFCCP. The agency’s comments during the town hall made clear that the agency did not intend to rely on the compliance certifications contractors make under the federal System for Award Management (SAM) procurement database, as other vendors had previously reported. Instead, OFCCP officials stated the proposed ICR would permit the “collection of AAPs per a portal.” No further details about what contractors would be required to upload was provided at the town hall so contractors should review the ICR when it is released and provide feedback to the agency about the proposal before it is finalized. During the town halls, OFCCP Director Leen and other OFCCP officials expressed concern about the percentage of women in leadership roles, especially in the financial, legal, tech, and academic sectors. The agency stated that it would closely review promotional activity, and the impact of upward mobility on compensation, during upcoming audits. OFCCP also expressed interest in exploring how leave policies, including parental or family leave policies, impact workers, including whether leave policies are being implemented equally for men and women, and whether the taking of leave steers individuals into a particular career path. Finally, the agency talked about employment of military spouses, and exploring how contractors can ensure equal employment opportunity for this population. All contractors should expect these areas to be a focus during upcoming compliance reviews. OFCCP Director Leen announced that the agency intends to conduct additional focused reviews related to contractor compliance with the VEVRAA requirements and to explore how individuals are promoted. No specific timetable was provided for when these focused reviews would begin but contractors should expect to see these additional focused reviews scheduled in future scheduling lists issued in 2019 and 2020. The agency announced it would be publishing additional materials on its website to help contractors comply for the upcoming Section 503 focused reviews, including the onsite plan and the Standard Compliance Evaluation Report (the “SCER”), that compliance officers will use during those reviews. This is welcome news for contractors who were selected to undergo a Section 503 focused review during this scheduling cycle. These documents will provide contractors further insight into the types of questions OFCCP may ask, including a road map of what OFCCP compliance officers are expected to review during a Section 503 focused review. OFCCP Director Leen noted that the average time to complete a desk audit during an establishment review has gone from about 120 days to about 32 days in the last 6-12 months. Director Leen also indicated he was very focused on making sure future reviews were conducted as efficiently as possible. Again, welcome news for contractors who have endured audits that lasted for many months, if not years, in the past. Berkshire is monitoring these developments, especially the two new proposed information collection requirements, and will provide updates as we learn them. Subscribe to this blog and stay tuned for more information in the coming weeks!